Half of your traffic is mobile. Let’s say it again: half of your traffic is mobile. Yes, you heard right. Maybe more than that depending on your industry and clientele. The way you provide video to mobile visitors is vital to keeping your company profitable as more and more web traffic comes via smartphones. On the positive side, if you aren’t accounting for this traffic—you could dramatically improve revenue and brand image by dedicating some time to this one fact of life. 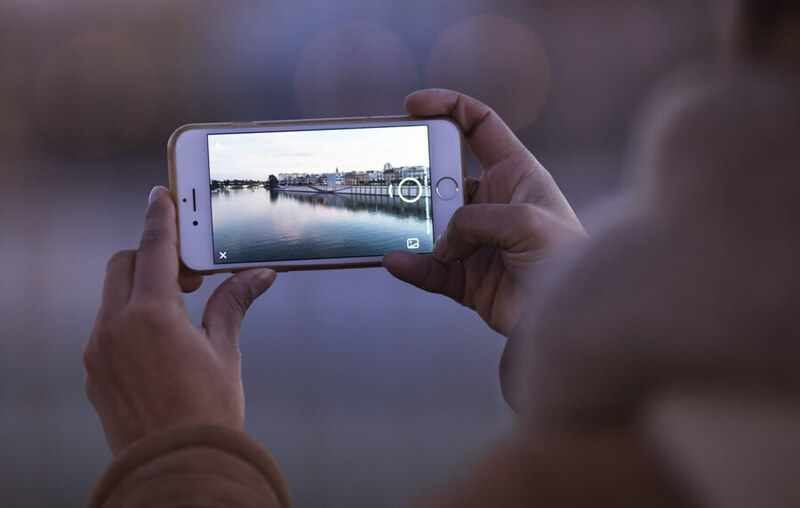 Fact: Over 90% of mobile video viewers share content with others. There’s more to it than implementing a responsive design, though. Having an experience that is tailored for the small screen will need special design, formatting, and making videos that suit both desktop and mobile users. Sound tough? We thought so, and it’s why we’ve put together this little guide to help you look better for both types of web traffic. Because while it is tempting to move towards mobile design only, don’t forget that 37% (this is a conservative number) of people often begin shopping via mobile and finish purchasing on a desktop. We’ll get deep in the weeds and go geeky to help you better serve your potential clients by looking better on mobile. To buy an online product in years past, it was all about scrolling. Scrolling through thousands of words of copy, guarantees, those little red lines and arrows. Just continuing to move down a seemingly endless page until you got to the price. And, you guessed it! The price, naturally, had a red line through it to reveal the “recently” lowered price. Now, people who were genuinely interested in your product enough to click a link will pretend you never existed if it takes more than 4 seconds to load. Put simply, people are increasingly demanding instant gratification and decreasingly patient when they do not quickly get the experience they desired. While we can debate the anthropological and societal travesties of this increasing mindset all day long, but we won’t. To get around all the self-absorption that mobile users have—use shorter videos. Using a mix of copy and video or a long video will have the mobile crowd leaving your page even if it looks good. No one wants to hold their phone while you walk through point after point saying something that could have been conveyed in a few short remarks. There are kickstands for phones now. And the average YouTube video length (most videos in the world) is just over 4 minutes. Do the math and just let these facts sink in for a second… people don’t even want to hold a phone statically for minutes. This is the world we currently live in. Bottom Line: If your video is too long, you’ll lose mobile viewers regardless of how well it’s visually displayed. This tip is good for any screen. When you have a video on the page, it should be doing all of the talking for you. Videos can be used for your homepage, but they are much better served on their own landing page. Related: How to Use an Amazing Landing Page Video the Right Way! A clear, concise video is practically ruined by a cluttered, confused site page. We’re not saying your site is as ugly as the one in the screenshot, or that you have to go minimal. But we are saying that on the page with the video, there are two actors. The video should be the star and the CTA is the best-supporting role. Even having a pop-up could be a disaster. Most pop-up plugins and software aren’t great for mobile. Users will get frustrated at not being able to see the video as well as not being able to close the intrusive pop-up. Most plugins will have the ability to stop them from occurring on certain pages and a really good one can determine whether or not it’s a mobile device. If pop-ups are working for you, just be careful and test the look/function on mobile. Wait a minute… Aren’t we at the tail end (of what seemed to be a decade) of the warnings about needing our sites to be responsive? Yes, but but based on the fact that 71% of people are saying they’ve recently bounced from non-mobile responsive sites, we’re going to guess that there is still work to be done. One thing people still need to do is set up their videos fit to suit the new mobile-optimized pages they’re building. Companies that are committed to video have spent thousands of dollars to make sure that their landing pages work right. Little pesky code elements called “iframes” have caused a lot of trouble the last few years. The point here is to test the video instead of just putting it on a page. You don’t have to custom code a page, but the page should be built around the video—and tested extensively on mobile. A good (read: responsive) video player (e.g. Wistia, Vimeo, etc.) should take care of most problems, but don’t bank on it. Check on Apple and Android devices, be diligent. Bonus Resource: Here’s a great instructional piece on how to get around this common problem. Great details, but will take someone with a basic knowledge of CSS and HTML. You can have a message that clearly and beautifully conveys your point and would move people into the frame of mind you intended. But if they can’t see what’s going on—you’ll lose them. A few words on the screen at the right time can really bring home the point. That said, if you use too much text, it’ll be smaller and harder to keep up with. If you’re viewers are struggling to read the screen, they’ll not hear your audio as clearly. Balance big viewable text and animation with a great script and you’ll keep their attention for the maximum amount of time (hopefully the whole time). Fact: Nearly 80% of decision makers will spend more time watching mobile videos over the next three years. Did you know that one little-bitty pause (e.g. buffering) in a video causes the average person’s stress level to increase 15 points? You really can test a person’s character with a slow internet connection. Don’t test your customers, if you can help it. Make sure that you have a mobile-friendly host for your videos. There are several good ones nowadays, but we have a few favorites. This tip may sound rudimentary, but it’s the one that could make or break it. The data shows that if a video takes only a couple of seconds to get going 4 of 5 people will move along without ever looking at your video. That’s 80%! Nothing more will make you look silly than a video that doesn’t play. How much of your traffic is mobile? Answer: Enough to make them worth catering to. Click here to sign up for your own exclusive access to our video + storytelling course!